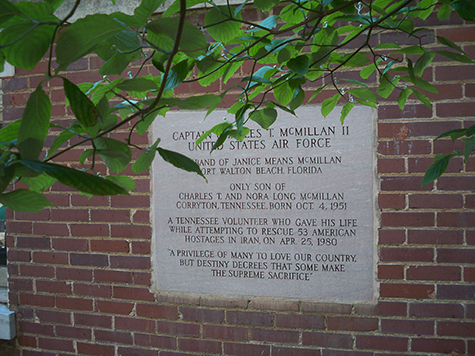 In memory of Air Force Captain Charles T McMillan II. McMillan was a Tennessee Volunteer who gave his life while attempting to rescue the 53 American hostages in Iran on April 25, 1980. The marker is embedded in the wall of the Old Knoxville Courthouse at 300 Main Ave Knoxville, TN 37902.